We all have ideas about God. Atheists and believers of all religions have some form of God-concept. This is another way of saying that we all possess a THEOLOGY. Christians derive their theology or God concept from the Bible. Other faith systems use other sacred texts. Atheist derive their God-concept (no-God) from their sacred texts and worldview teachings. All of us measure these ideas in relation to our own experience and our own ability to wrap our heads around the idea of God. Many faith traditions (including Christianity) have what I call a “Sniper God” concept. Its the idea that God is watching us at every moment and then waiting for us to sin or mess things up. Typically, the more “reformed” a denomination is, the more they try and assert that all words, verses, and concepts in scripture are 100% inspired, perfect and flawless in describing who God is and what God desires of his people. They often see the ancient “God-concepts” captured in scripture as necessary to today. Within these systems is an impregnated notion of apostasy (the idea a person will lose their salvation if they sin too much). This creates a scorecard theology of who is the bigger sinner and when a person does sin, the feelings of fear, guilt, and failure pile up higher and higher. Even though there is a belief that Jesus can save a person from all of that, he only does so intermittently. This leaves people feeling pretty bad most of the time and it drives them deeper into the institutions that use this line to gain economic, social and institutional power. You can see how they get here by reading through the Old Testament. The God-concept of the Old Testament people is that God had no problem smiting people. One story in Joshua 7:10 depicts a man named Achan who saw some silver and nice linen when he was invading a camp. He coveted them and then took them and buried them in his tent because he was told not to touch anything from those people. Even though he repented when confronted with his transgression, there was no mercy and they stoned and burned and buried him on the spot. Afterwards, God was happy again. This is one of many examples like this but typifies this notion that modern people must live in fear of God’s sniper fire. Not all Christians, Jews or Muslims have a “Sniper God” mentality. However, it pains me to see this wherever it exists. Whether it be internally manifest as in a guilt ridden person who thinks God hates them, or externally displayed in those who think killing others is a way to be God’s hand on the trigger. Both parties have gained a religion and missed God. So how does this gel with Jesus and the woman who was caught in the act of adultery? He didn’t encourage the religious elite to throw the stones. (He didn’t prohibit it either). He just reordered the measuring stick from the external action to the internal contemplation. Rather than use fear to destroy her, he loved her into wholeness and restoration. This is the opposite of apostasy. In the presence of Christ, her terrible sin was simply passed over, not punished. I lived many years with a God concept where I had a lazer tagged onto my chest most days. It produced fear, anxiety, and the kind of repentance was solely based in self preservation. Now I see things so much differently. Repentance isn’t an act, but a process of changing our minds. It’s more like a description of what it looks like for something lost to find its way back to a loving home (Luke15). In this sense it is not heavy handed, or manipulated. It is a response from within the heart that says, I actually want to be a better person and that means I need to work on some things. Given that revelation, it stands to reason that not only those in the Christian faith will have this experience. In fact that is precisely what we see. This doesn’t minimize the fact that the work of Christ on the heart is prompting and calling for this change of behavior, it only means that a person need not be fully aware that it is Christ who is doing the calling. 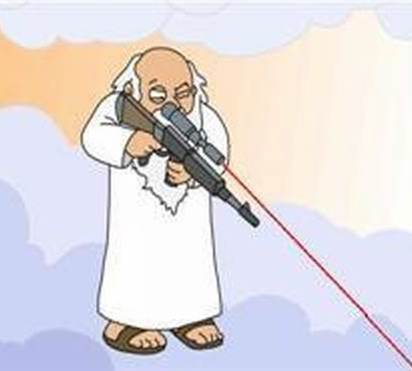 If you live with a sniper-God concept. Can I encourage you to be a bit more honest in your prayers. Your behavior is not as good nor as bad as you realize, and the measuring stick isn’t located there anyway. The cross means the end of appeasement, thus the end of religious systems that oppress and use fear to control behavior. It’s revolutionary freedom that all comers are invited into. Humility is the gateway. The apostle John put it this way. “There is no fear in love, but perfect love casts out fear. For fear has to do with punishment, and whoever fears has not been perfected in love.” (1 John 4:18.) Thus it seems we have a choice of two key God-concepts. The fear way (which we see in religious systems), or the love way which we find among humble people who recognize their own faults and thus extend grace and love to others. This entry was posted in New Wine, The Deep End and tagged forgiveness, God, religion, repentance, sniper, theology. Bookmark the permalink. Love the post and the “sniper god” concept. Voltaire said that, “ If God did not exist, it would be necessary to invent Him.” It seems that Voltaire got it half right. To be more precise, God does exist but man invented him anyway.